Our pottery teachers will be supporting the fundraising efforts for Hearts in Harmony on Friday 12 May 2017. Hearts in Harmony, the charity raising money to help fight heart disease through art and music, will donate all money raised on the day towards the treatment of heart disease. There will be up to 50 talented artists at Old Spitalfields market showing their work. 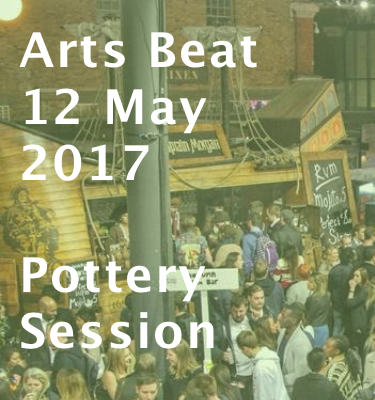 Hosted by Old Spitalfields Market’s official charity, Hearts in Harmony, ‘Art Beats’ is a chance to experience live art on a grand scale. At the end of the day-long event, which runs from 11am-9pm, a panel of five expert judges will select one entered piece of art, from a final shortlist of eight, to win the Art Beats Award, plus a cash prize of £1,000. Clover Lee, from the Great Pottery Throwdown will be joining the sessions, she recently joined Kite Studios, as a pottery teacher. Book your slot online. All proceeds go to Hearts in Harmony.